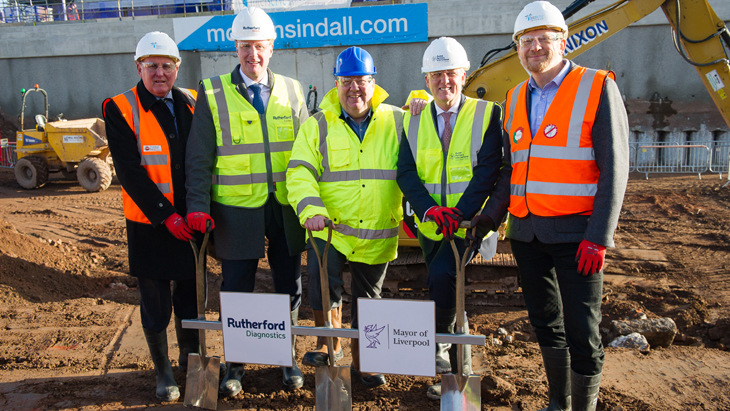 Liverpool, England, 8th January 2019: Work began today on one of the most advanced healthcare diagnostic centres to be built in the UK. Liverpool is to be the site of the flagship HQ of Rutherford Diagnostics, located in Knowledge Quarter Liverpool (KQ Liverpool) at Liverpool City Council’s £1 billion Paddington Village Development. The centre, which will be the first in a network of centres, will address the significant shortage of diagnostic provision in the UK resulting in patients waiting weeks for test results. The turf cutting event for the £20 million-pound project was led by CEO of Proton Partners International Mike Moran, Liverpool Mayor Joe Anderson, Chief Diagnostic Officer for Rutherford Diagnostics Dr Steven Powell and Professor Dame Janet Beer, Vice-Chancellor of the University of Liverpool and Chair of KQ Liverpool, exactly a year to the day since the turf cutting of the Rutherford Cancer Centre North West just a few yards away. Rutherford Diagnostics aspires to be at the forefront of revolutionising healthcare by becoming a leader in the prediction, prevention and earliest possible detection of disease, as well as being equipped to conduct the most complex of diagnostic tests across a wide range of conditions using the latest technologies. The company’s goal is to reduce waiting times for diagnostic tests from weeks to days and develop real partnerships with private healthcare and NHS organisations to help achieve this. Mike Moran said: "Once complete this centre will represent a true step change in the way diseases are detected and treated. Britain’s approach to healthcare is unfortunately very reactionary, often responding to diseases whenthey have reached an advanced stage. We hope to turn that around using personalised screening and advanced diagnostic technologies." At the heart of Rutherford Diagnostics will be genomics, the recording of whole genome sequence data which will be used to predict disease, susceptibility, and treatment and drug response. The core technologies Rutherford Diagnostics will provide include Spectral CT, digital PET-CT, 3T MRI, ultrasound, endoscopy, and a commercial genomics laboratory. Dr Steven Powell said that a more progressive approach to disease management is critical to improve the nation’s health: "By utilising and developing innovative technologies, such as genomic sequencing, personalised screening and state-of-the-art diagnostics, we hope to reduce levels of acute illness and support good health. It is only by proactively targeting illness at its roots that we can transform healthcare and engender good health across Britain." The five-storey centre will be built by the council’s appointed contractor Morgan Sindall, and is adjacent to the Rutherford Cancer Centre North West (also operated by Proton Partners International) and directly opposite the Royal College of Physicians’ new Northern headquarters, which is situated in The Spine, a new 200,000 sq ft building. Mayor Joe Anderson hailed the ground break as a landmark day for Liverpool; "This diagnostics centre is going to be a fantastic addition to Paddington Village and further boosts our plans for a world leading innovation hub in the heart of the city’s Knowledge Quarter. Paddington Village is gaining real momentum now with renowned tenants like Proton Partners International, the RCP and Kaplan investing in the city and creating highly skilled jobs – and the great news is that there is much more to come." Northern Powerhouse and Local Growth Minister Jake Berry MP said: “It’s fantastic to see work begin on the new Rutherford Diagnostics Headquarters in the heart of the Liverpool Knowledge Quarter, which has been developed as part of the £332 million Growth Deal for the Liverpool City Region. Liverpool is rapidly establishing itself as a global leader in the area of MedTech, building on decades of pioneering work by the Liverpool School of Tropical Medicine. "This multimillion pound project is another demonstration of the drive for economic growth in the City of Liverpool. We are ensuring medical innovation is revolutionising healthcare across the Northern Powerhouse and leading the world."